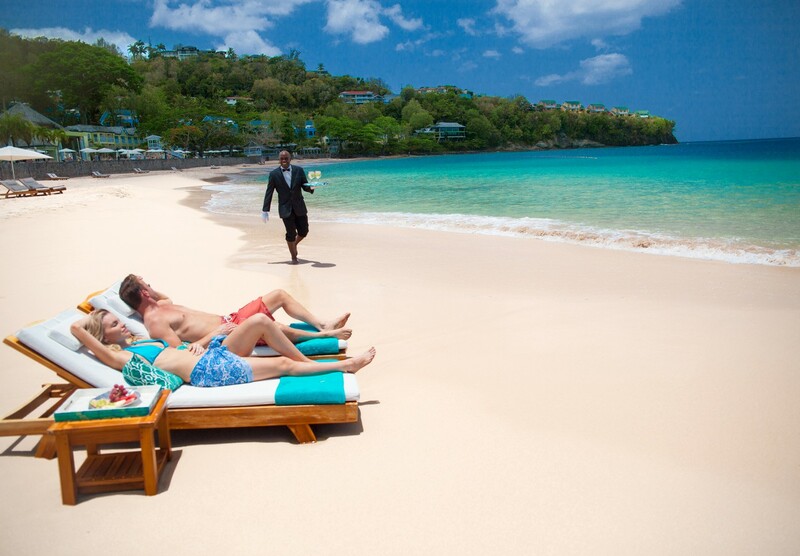 Experience a Sandals Luxury Included Vacation, an incomparable showcase of quality, choice, and welcoming hospitality. 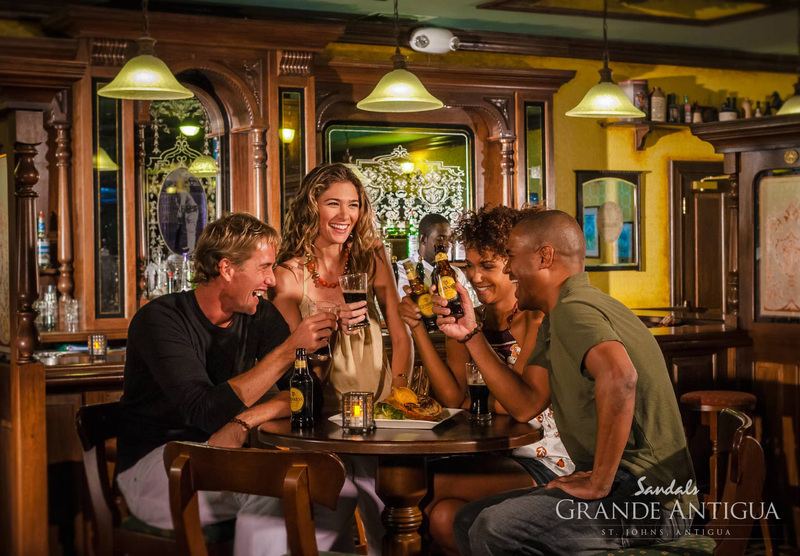 At Sandals, there are no schedules to follow or appointments to keep, just unscripted days and sultry nights for you to spend as you wish. Play in the ocean, stroll along the sandy beach, or nap in a garden hammock. Passions are ignited as you snuggle alongside one of our signature beachfront fire pits while sipping your favorite cocktail beneath a blanket of twinkling stars. Enjoy a gourmet meal in one of our 156 restaurants, or enjoy a candlelit dinner on the beach. Your dream vacation is a call away… let us help you find the perfect Sandals destination. 24/7 food and drink availability, to include up to 16 restaurants per resort and up to 11 bars per resort; all liquor is premium brands and Mondavi is the house wine offered. Check with our travel specialist for Lobster season at Resorts. 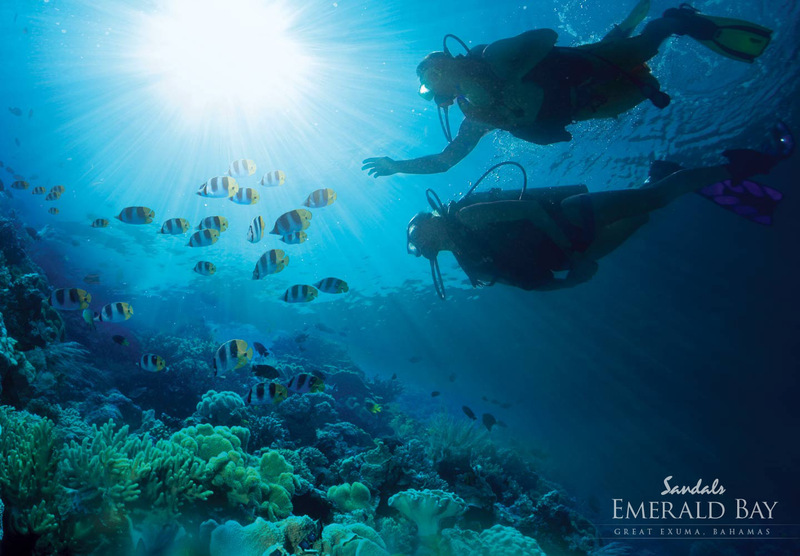 Unlimited Use of Water Sports – to include waterskiing, wakeboarding, tubing, kayaking, hobie cat sailing, paddle boarding, windsurfing, glass-bottom boats, aqua trikes, and scuba diving. Unlimited Use of Land Sports – to include tennis, indoor game rooms, billiards, darts, racquetball, squash, table tennis, board games, volleyball, basketball, bocce ball, shuffleboard, croquet, rock climbing, beach volleyball, lawn chess, horseshoes, and golf. Spa Facilities and Fitness Center – Enjoy the spa facilities which include the sauna room, steam room, Jacuzzi, plunge pool, and locker facilities. Spa treatments are an additional fee. The fitness center offers top of the line Life Fitness equipment, as well as fitness classes offered daily for yoga, Pilates, morning power walks and more. 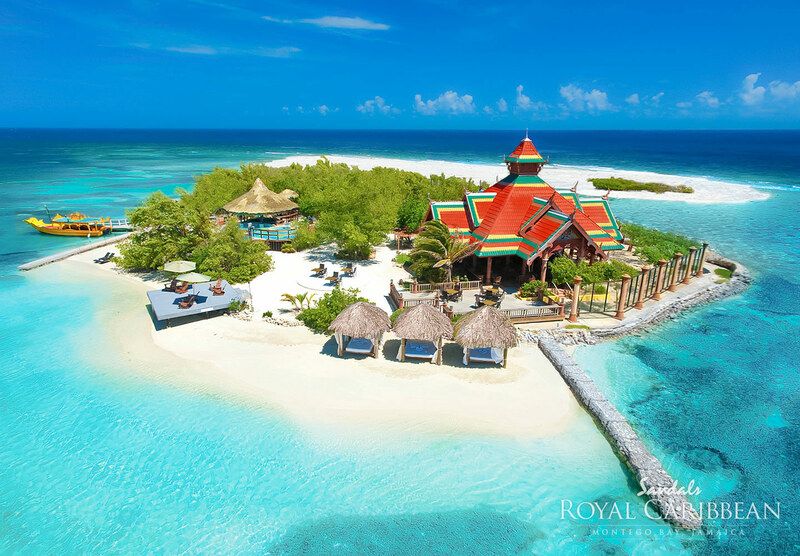 Only Sandals offers a private offshore island with every resort amenity! The adventure begins with a complimentary ferry that takes you back and forth all day. Step ashore to chic outdoor lounges and cabanas, Zen gardens, pools with swim-up bars, cozy hammocks, island entertainment, snorkeling areas and more. You’ll find a restaurant that transitions from a casual grill by day to a sophisticated restaurant by night, serving seafood (Sandals Royal Bahamian) and authentic Thai cuisine (Sandals Royal Caribbean). Each Sandals Resort offers its own distinctive personality and you are welcome to stay at one resort and play at the others as well. In St. Lucia and Jamaica we offer several resorts close to each other that you can visit and use with all-inclusive privileges. 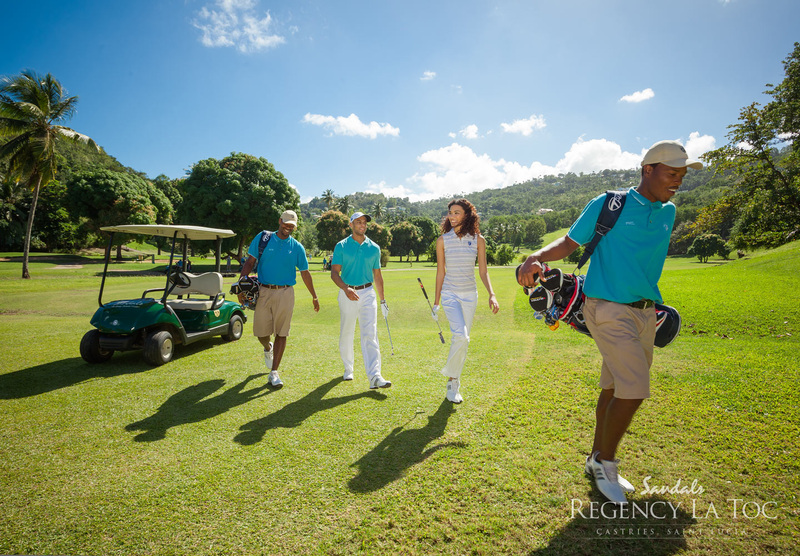 Complimentary transportation offered throughout the day at the St. Lucia and Montego Bay properties. Interested in upgrading your room? Request a Club Sandals room at your preferred destination. You will receive private check-in, club sandals lounge access, all day room service from 7am – 10pm, In-suite bar stocked with Mondavi wine, premium spirits (Jamaican rum, vodka, whiskey), sodas, juices, and bottled waters. Club Sandals rooms will enjoy members only activities and private parties throughout your stay. Looking for the ultimate service? Reserve a butler elite room and experience the epitome of service. Butlers and Concierges are trained by the elite Guild of Professional English Butlers. They will handle your every need, to include in-suite private check in, orchestrate in-room preferences upon arrival, offer to unpack your suitcase, provide you with a cell phone to reach them at any time, take room service orders for breakfast, lunch and dinner, handle your laundry and dry cleaning needs, draw a scented, flower-petal bubble bath, bring you snacks and beverages anywhere in the resort, reserve beachside and poolside chairs, re-stock in-suite bar with your preferred beverages, and more!